Here is part four of my non-fiction work about the National Radio Astronomy Observatory. You can also read parts one, two, three, five, six and seven. This is the place at NRAO where all of the circuitry is put together for the observatory. It was named after Karl Jansky. First, let’s understand their particular kind of telescope. We normally think of a lens-based device when we hear the term “telescope” but in NRAO’s case, a telescope refers to a large radio antenna that helps them “see” radio signals that are emitted far away. A radio telescope operates in two different fashions. In the first, radio signals come from space, hit the main reflector, the sub-reflector, and are then are beamed down to the receiver room. 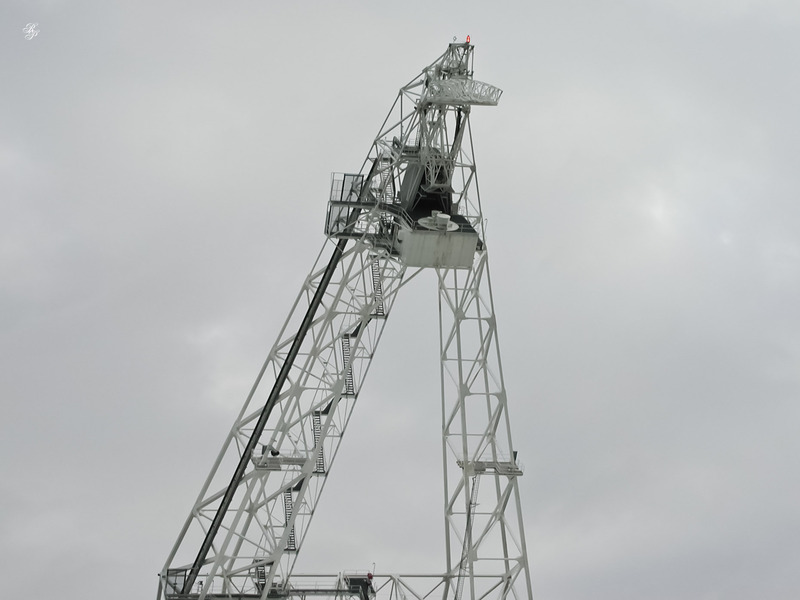 For the second type, a boom is swung out above the dish, and the signal is reflected directly into the receiver that gets mounted on the boom. For both types of telescopes, the signal is fed into a receiver through a feed horn that’s machined out of aluminum and anodized. 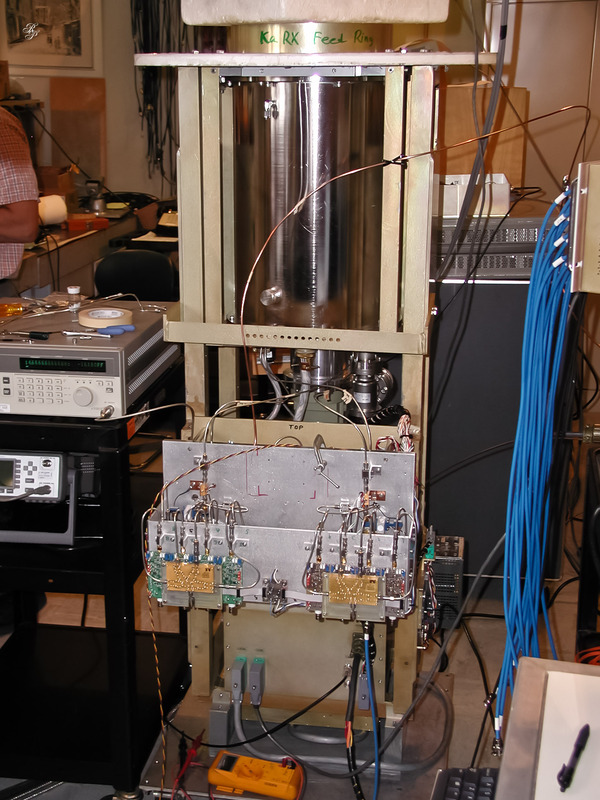 The receiver is housed in a vacuum. The feed horn isn’t made from layers, it’s a single machined piece, milled from the inside. Feedhorns vary in size, but they fulfill the same purpose every time: they funnel the radio waves into the receiver. Inside the receiver, they’ve got a wave guide, which is nothing more than a metal conduit, but it’s a very special conduit, that drives the signals directly to the amplifier through the vacuum chamber, which is called a “dewar vessel”. An ortho-mode transducer “straightens out” the radio waves. If you look at the antennas in your neighborhood, you might see they’re pointed either vertically or horizontally. Most of the man-made radio signals are transmitted with a linear polarization. They’re either horizontal or vertical. The ortho-mode transducer takes circularly polarized astronomical radio signals and splits them into horizontal and vertical radio signals. These transducers also vary in size depending on the telescope where they’re used. All of the receivers are housed in vacuum chambers equipped with refrigerator pumps. All of the components are built in-house. The amplifiers, for example, are made in the Central Development Lab in Charlottesville, VA. Because the operations at the observatory are so unique, there are no companies making certain parts, and NRAO has to manufacture them. I gathered from talking to Mr. Sizemore that most every time they relied on outside contractors to do work at the observatory for certain projects, the results were much less than satisfactory, even with close supervision. In the end, more time, effort and money was spent with contractors, when it would have been quicker to do things in-house. The rule now is that they do everything they can do, unless it’s not feasible or practical. NRAO has gotten more involved with fiber optics. Interference problems in the past weren’t necessarily caused by the feed from the receiver, but from the cables that connect the receiver to the control room. What NRAO now does is to convert the radio signals to optical signals and bring them to the control room that way, unaffected by line noise. It’s converted back to a radio signal there, without any loss. Long cables act just like antennas, and pick up signals unwittingly. That’s why the quality of your cable TV signal improves if you use higher quality coaxial lines (thicker copper, more shielding). That’s also why Monster Cable is doing so well. They’ve managed to convince most folks that it’s worth it to pay extra for higher quality cables if you want less interference. Same concept. The difference there is that you experience little to unnoticeable interference for short cable runs like the ones from your TV to your amplifier, for example, so unless you’re using really poor cables, your signal will barely suffer. Another analogy is the use of optical fiber lines to connect buildings on a common LAN (Local Area Network). The signal would simply die out or incur too much interference if it would be carried through regular CAT5 cables from building to building, especially if they’re spread apart, so what’s done is the electrical signals from the CAT5 cable are converted to optical signals in a switch room, then carried through a fiber optic line from one building to another, where they are once more converted to electrical signals in another switch room. What people have now started doing is to forgo fiber optic lines altogether and simply transmit the signal through laser from one building to another. It’s still an optical transmission; it’s like shining a flashlight and seeing the beam. Here you’d need a clear line of sight, and during inclement weather, the quality of the connection would decrease or drop out altogether. Usually, an engineer and a technician are assigned as a team to take care of a receiver. 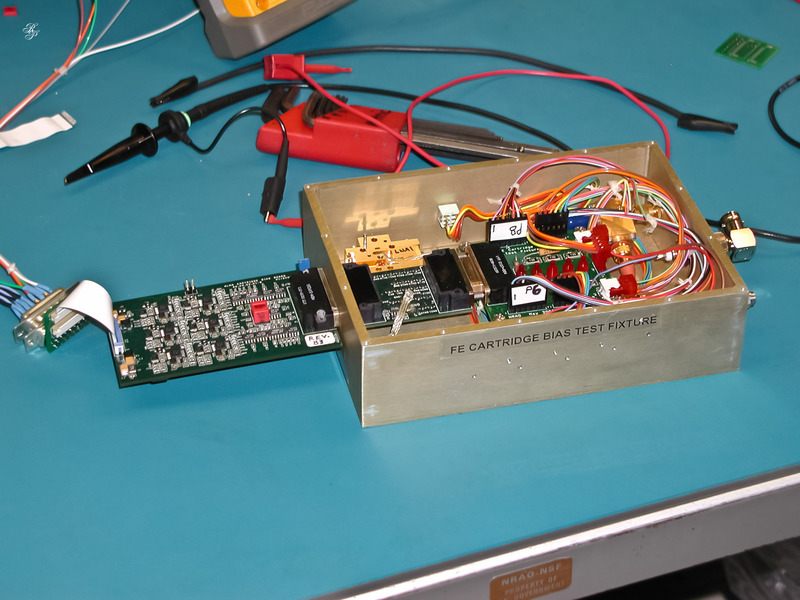 This photo shows the work being done on the W band receiver, which is a high-frequency receiver. NRAO hopes to be able to receive the high-frequency band in late spring or early summer of 2006, which is when I hope this book will be published [sic]! The higher in frequency folks get, the harder it gets to focus the waves, because they are so small that any irregularities in the dish shape can smear them, or put them out of focus. As work is being done on the higher-frequency receiver, they’ve got to be really careful about what they’re doing, or things won’t work properly. Most of your current devices have something called Field Effect Transistors. 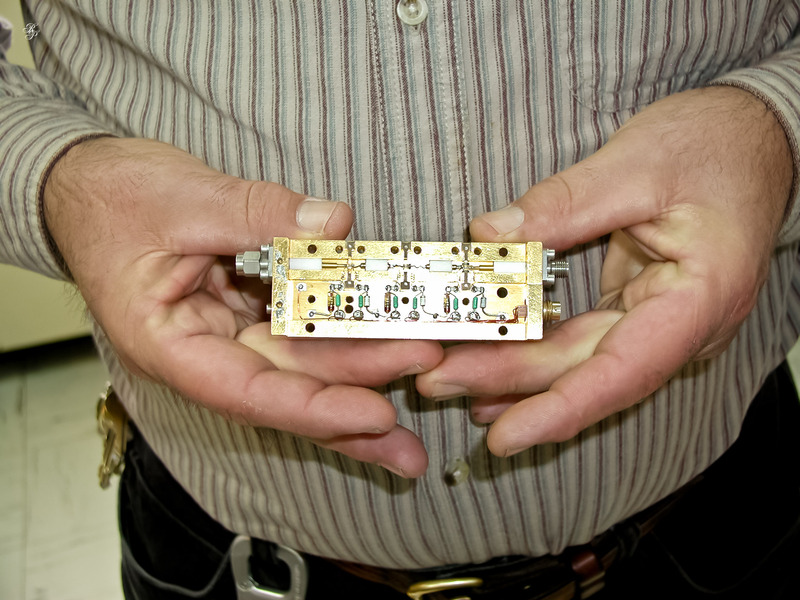 NRAO uses High Electron Mobility Transistors, which are the next generation of transistors. 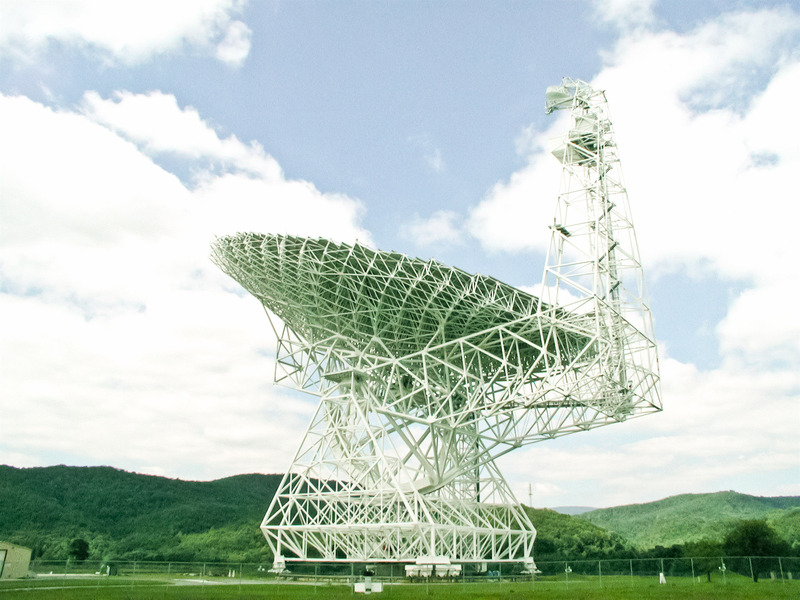 NRAO happens to be the proving ground for new technology. The first transistor they used cost about $50,000. Its manufacturer, a company in Japan, gave it to NRAO for free, asking them to try it. If NRAO would be happy with it, they’d know everyone would be also. Why? Nobody works to the standards of NRAO, in terms of signal fidelity, clarity, etc. If an electronics company can satisfy NRAO, they’ve just satisfied everybody in the world. For that reason, it’s not seldom that companies contact NRAO and offer them products to try. All that they ask is for data in return. How did the product behave? What are its limitations? What can be improved? It works out very well for both parties. That’s one of the direct spin-offs for NRAO’s work. Everyone in the world benefits indirectly from the work they do. 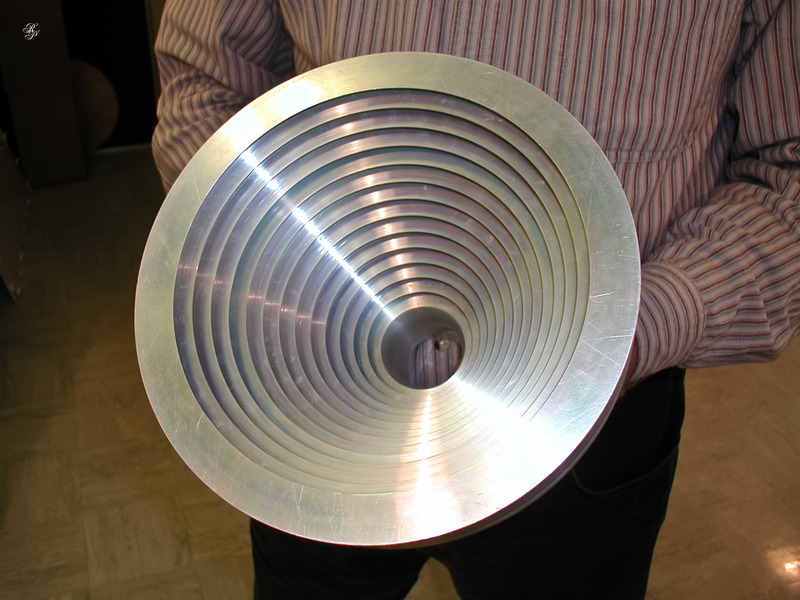 Most amplifiers at NRAO start out as solid pieces of aluminum. They’re machined by them, on-site. Nowadays, the amplifiers are made at the Central Development Lab in Charlottesville, VA, also part of NRAO. Again, the rationale is very simple. That sort of a product simply can’t be bought commercially. 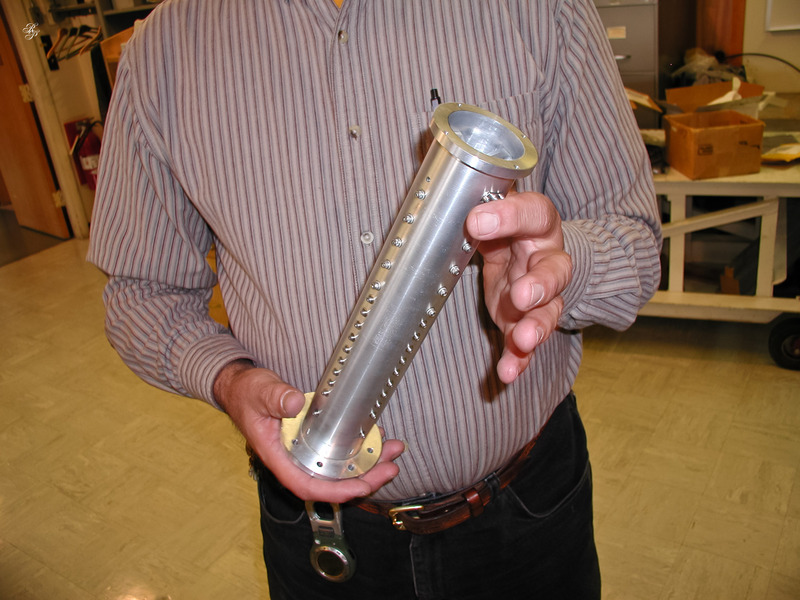 It’s not available, just like most of NRAO’s components – they are one of a kind. 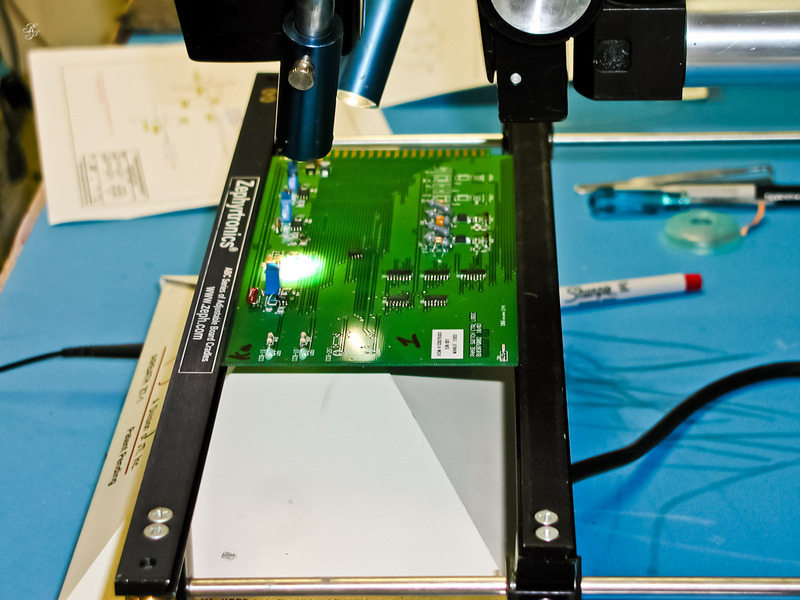 One of the other things that NRAO has gotten involved with is the surface-mount technology for different electronic components. Some of them are so small that if you were to sneeze around the technician, it would very likely mess up his work. Each little cubbyhole, people are building different components. In one, folks are at work on the Alma Array, which is getting built in the Chilean Atacama Dessert. JD, a technician, and one of the engineers, are working on the little cards (circuits) that will process the signals received there. The Array will employ many telescopes and many cards will be needed. It’s a good working environment at NRAO. It’s a rural area, so by nature people try to maintain good relationships. In Wesley’s words, “the guy you piss off may be the guy you need to help you get out of the ditch in the winter,” so there are extra incentives to maintaining friendly relationships. There are some downsides, as well. For major shopping, the closest towns are 1 ½ hours away, like Harrisonburg or Roanoke. 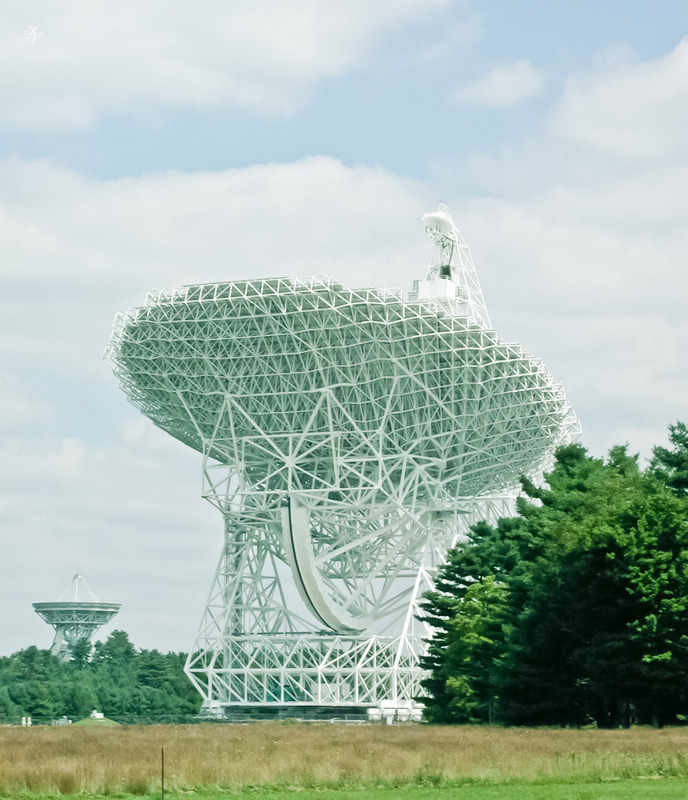 The United States is not the only country involved in radio astronomy. There are observatories throughout the world. 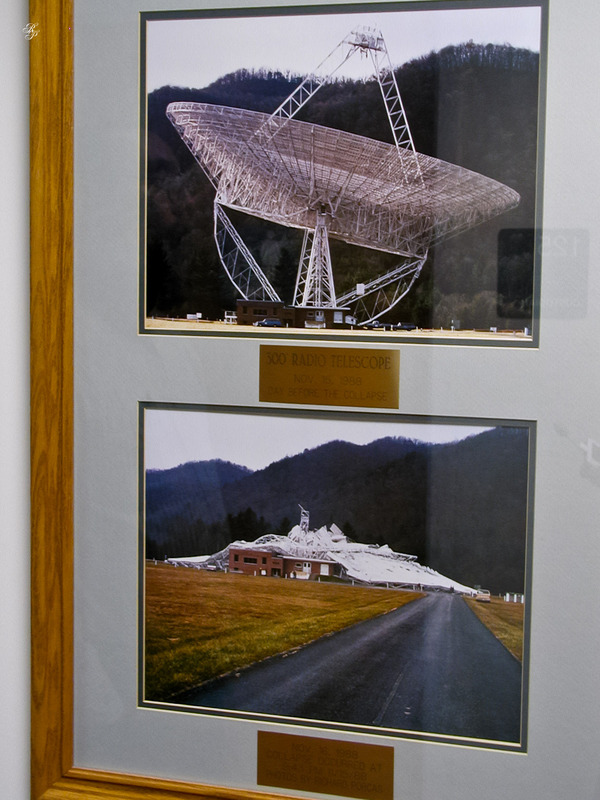 There are maps in one of the NRAO lobbies showing the locations of such observatories. The unique thing about the Greenbank observatory is that it is protected by the National Radio Quiet Zone. This is the only area where folks are compelled to coordinate all radio frequencies with NRAO. There are some other areas in the world such as Puerto Rico, where limited frequencies are controlled. Incidentally, the Puerto Rico telescope was used in one of the James Bond movies. The NRAO folks are waiting (but not holding their breaths) for the Green Bank Telescope, the GBT, to be used in one of the science-fiction movies. It’s just so out of this world, in both its proportion and look, that it’s bound to end up in a sci-fi movie sooner or later. Some of the telescopes are single dishes, and some are arrays. Why do you need an array of dishes? Well, why do you have two eyes instead of one? The answer is depth perception. The term in radio astronomy is spatial resolution, but it’s the same thing. You want the large collecting area of the single dish in order to get the weak signals. You want the arrays of telescopes in order to get the depth perception. Ideally, NRAO would like to have an array of GBTs, but it’s not economically feasible. In those cases, the GBT can be used as one part of an interferometer – that’s another word for arrays. That way you can get the best of both worlds. You can have a large collecting area – for signal strength – and a remote telescope, somewhere else, that gives the astronomers the base line signal, for spatial resolution. The further your “eyes” are spread apart, the better you perceive “depth”. For telescopes that are close together, technicians can use wave guides to gather signals from each, but for telescopes that are far apart, it becomes impossible. So what NRAO does is to use GPS signals. Each one of the telescopes records the data individually and marks it with GPS ticks from GPS satellites. The data then gets sent to the Array Operations Center, where all of the data is brought together and synced using the GPS timing ticks. 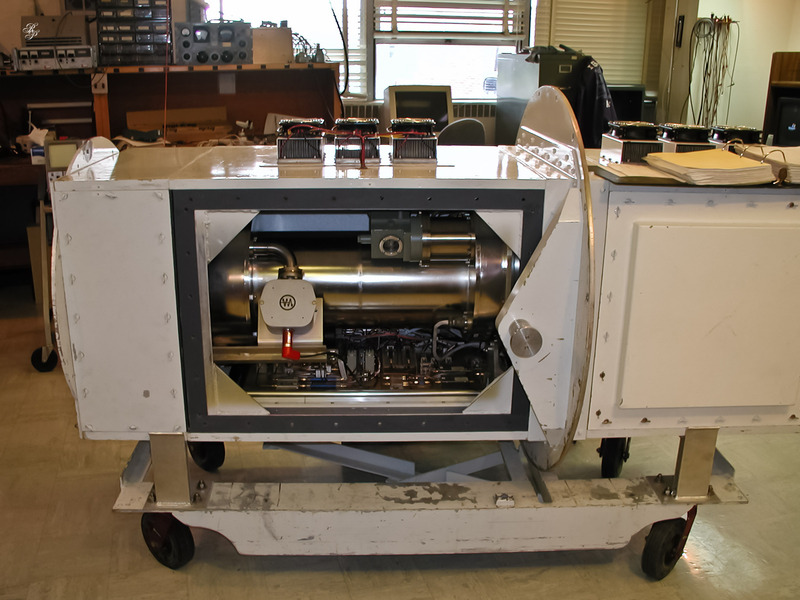 One of the first interferometers built was at Green Bank. It was a three-element interferometer. It worked great, so they got some money together and built the array in New Mexico, which is currently an array of 27 telescopes and will be expanded to 35-40 telescopes in the near future. They got even more excited about the capabilities of interferometers and decided to make a very long baseline array of 10 telescopes. They used 8 telescopes in the US, one in the Virgin Islands, and one in Hawaii. The long baseline array also worked very well, so they set to work on building an even bigger array. Unfortunately, the found out it couldn’t be done on the face of the Earth. If the telescopes are too far apart, they can’t see the same object at the same time. The solution to the problem is to put a radio telescope in orbit around the Earth. NRAO actually did a project with Japanese researchers, where they put a telescope in an elliptical orbit around the Earth, and NRAO used the GBT to get the best of both worlds. They had the large collecting area for signal strength and a huge baseline for spatial resolution. Let’s carry the situation even further. “What about sticking one on the moon?” I asked Mr. Sizemore. “We would like to,” he said. There are plans to do that. Ideally, it should be located on the dark side of the Moon, because it’s never toward us – the Earth. It always faces toward space, and thus would incur significantly less interference from radio signals coming from the Earth than terrestrial telescopes. The stepping-stone to that would be to put a telescope at the LaGrange points, the gravitational balance points between the Earth and the Moon or the Earth and the Sun. This is the 300 ft telescope that fell down some time ago. It was a perfectly calm night, there was no wind, no weather at all. When it collapsed, they decided to do a finite element analysis on it, and discovered (after the fact) that indeed it would have fallen down sooner or later. At the time it was built, it was designed to the best of the available technology. Unfortunately it simply reached the end of its useful age. Nobody was at fault. What actually happened was that a gusset (a joining place) cracked, and when it failed, it took about 12 seconds for the entire telescope to crash down. They were able to determine that from watching the temperature data on the receiver. The temperature went up as the telescope went down, and then the data simply stopped recording as the sensors and wires got destroyed. Remember, the receiver’s kept in a refrigerated vacuum, and it stopped functioning when the structure started coming apart. NRAO sold the telescope for $10,000 for scrap metal, then it cost them $30,000 to clean up the asbestos damage in the building. “We actually lost on that deal,” said Mr. Sizemore. The GBT has several innovations. The most obvious innovation is the offset feed. If you look at the other telescopes on site, you will see they all have the boom holding the receiver in the center of the reflector. Not so with the GBT – it has its receiver off-center. With a center-mounted feed, man-made signals will get reflected by the legs of the boom and cause interference. The GBT doesn’t have that problem. All of the astronomical signals get correctly reflected into the sub-reflector, then into the receiver, and from there get transported into the Control Room. Another unique innovation about the GBT is that it’s fully adjustable. All of the panels – and there are over 2,000 panels – can be moved individually. The moving weight on the telescope’s track is about 17,000,000 pounds. NRAO believes the GBT is the largest moving object on ground, and no one has disputed that yet. The only larger moving object on Earth is a ship at sea. The tipping weight on the elevation axle this year is around 13,000,000 pounds. When you tip that much weight, gravity will tend to sag the reflecting surface and distort it. NRAO needs to keep that reflector as accurate to a parabolic shape as possible, because that will dictate their efficiency at high frequencies, where the wavelengths are shorter. The dish is built in such a way that they can adjust each individual panel to take out any deformations in the overall shape. The original plan for solving this problem was to use a laser ranging system. Twelve lasers were set up around the dish, giving them a known reference plane. They would then use additional lasers pointed at the dish, at the feed arm, and other different points on the structure. Any movement of the structure could be monitored that way. By doing this, they found out that the gravity deformation was not as serious as the thermal deformation. The structure was getting heated and cooled at different rates depending on where those parts were located. The chief culprit was the sun. It would shine only on certain portions and not on others, subsequently causing thermal expansion in those exposed parts. So NRAO stopped relying on the laser sensors, and started using thermal sensors. They mounted about 20 such sensors around the structure, in order to compute the thermal variations and use that data to correct the focus of the receiver and the positions of the individual plates in the dish. They are still working out the details of the thermal sensor monitoring and adjustment. Once they work this part out, they’ll go back to the laser sensors for the fine tuning. 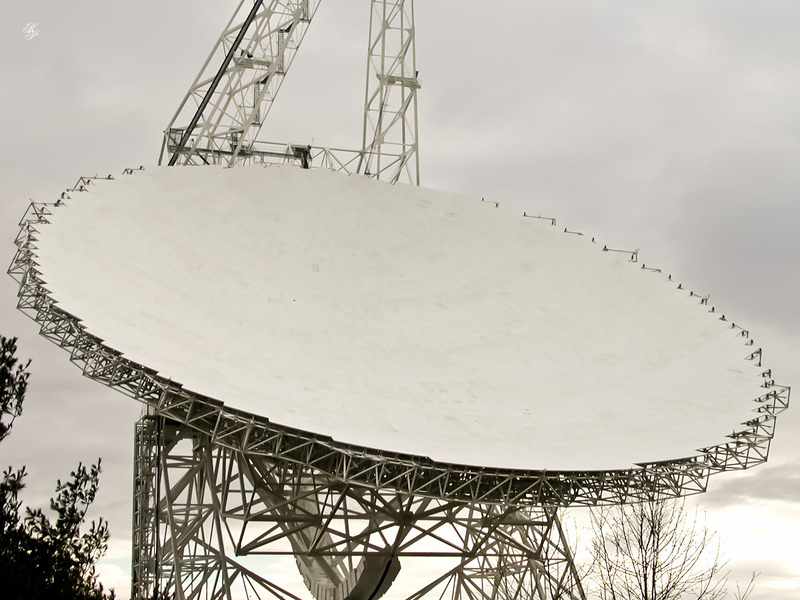 Their goal is to keep the 100-meter dish within 1/5,000th of an inch of the horizontal plane. That’s the thickness of a sheet of paper. Amazing, isn’t it? Because of the fine adjustments they can make, they are able to advance to higher frequencies such as 50 GHz and soon, 100 GHz. They are doing science that hasn’t been done before. They are finding things that could not be found with any other instrument in the world. Mr. Sizemore showed me photographs of the construction of the dish. What many people don’t know is that it was built three times! It was put together once, at the manufacturer site, then it was taken apart and shipped to NRAO. Once there, as many of the parts as possible were assembled on the ground. A large crane was then used to lift them into place. One of the other unique innovations of the structure is that it is a continuously welded structure. There are no bolts supporting weight in the GBT. They will never build a structure like this that is bolted together, including bridges. When the 300-foot telescope collapsed, they did an analysis and found out that the collapse was caused by a tiny crack in the material that had gotten larger over time. Engineering studies have actually shown that any time one punches a hole in metal, one makes a stress fracture that will propagate over time. What one must then do to avoid these fractures is to never punch holes in metal that is supporting weight. It must be welded. In building the GBT, over 50 tons of welding wire were used. About 300 welders tested for the job, and only about 30 of them passed. The welding needed to be very precise and very accurate. Some of the passes they had to weld involved dozens and dozens of back and forth welds to fill up large gaps. Of course, NRAO does constant testing of the structure. All of the welds are inspected, radiographs are also taken, and all of the constant maintenance ensures the structure remains in great shape. That was part four. You can also read parts one, two, three, five, six and seven.